Protein can be a controversial subject—some people feel that bringing up the topic is a criticism of vegetarianism. I disagree; I’ve been a vegetarian for over 20 years, I have no intention of eating meat again, but while pregnant and breastfeeding, I did find it a struggle to get the recommended amount of protein each day unless I ate intentionally. If you don’t have that issue, this book isn’t for you, but if you’re looking for ways to boost your meals with a little extra protein (and don’t mind using protein powder to do it), you will enjoy Terry Hope Romero’s new cookbook. Target has become one of my favorite places to shop for food—I swear their frozen section has more vegetarian options than all of our local grocery stores. These bowls from Sweet Earth are my latest find. 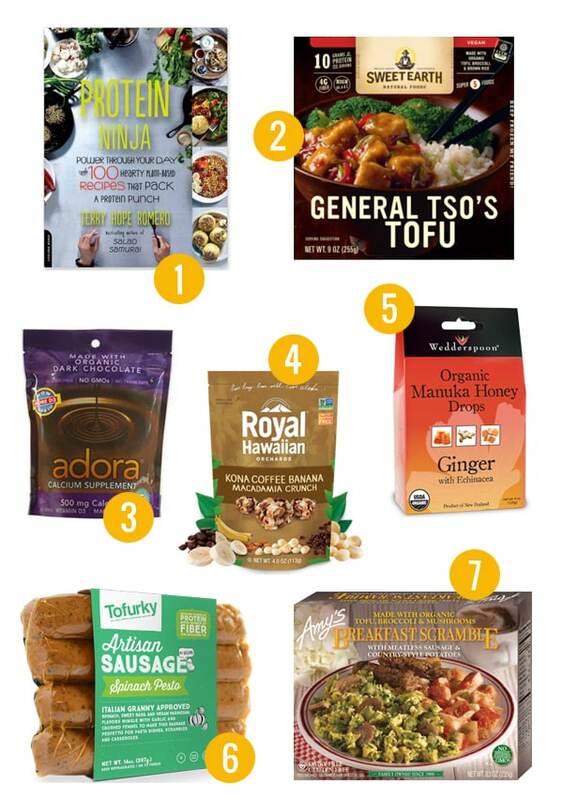 With varieties like General Tso’s Tofu, Enchilada Suiza, and Pizza Mac & Cheese, it’s hard not to want to try them all. I have so much trouble remembering to take my calcium supplements. I take my other supplements with meals, but since I can’t take iron and calcium at the same time, I have to take my calcium between meals and that means it usually falls to the wayside in the chaos of the day. Is it a coincidence that I started remembering to take my calcium when it was in dark chocolate form? Probably not. I love these. These snacks come in 3 flavors: Blueberry Pomegranate, Kona Coffee Banana, and Mango Pineapple. We enjoyed them all, but Kona Coffee Banana was my personal favorite because: coffee. These are so tasty—crunchy, rich, with a perfect balance of flavors. They’re quite possibly the perfect snack for a road trip too. Our household has suffered through one cold after another this year and we’ve probably gone through hundreds of lozenges in the past 6 months, but these are definitely are our favorite. Honey is soothing for colds and Manuka honey has the bonus of being made from the pollen of the tea tree, which lends it additional medicinal properties (I’ve been using Manuka honey as a healing facial mask for years!). While these drops won’t shorten your cold, they will soothe itchy throats and they taste good too. Tofurkey, I owe you an apology. Not being a fan of your Thanksgiving roast, I had written off all of your other products. I don’t eat a lot of processed faux meats because I find them to have questionable ingredients, but after spotting these at our local co-op, I checked out the ingredients and there was nothing on the list that I avoid, so I decided to give them a try. I’m so glad I did! These were awesome sliced up and added to pasta. It’s not just a scramble—there are also potatoes! And sausage! Amy’s Kitchen is a perennial favorite around here and meals like this make it easy to see why. It’s a plate full of comfort food goodness.